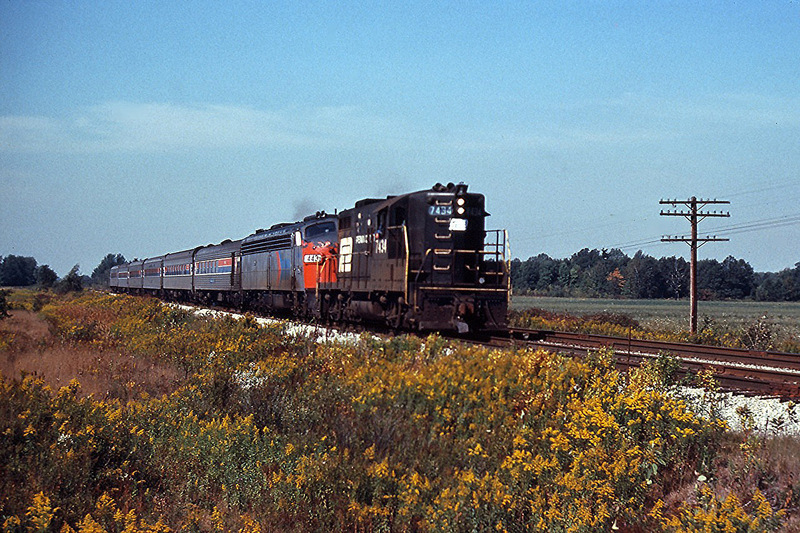 Railpictures.ca - Doug Page, Bruce Acheson collection Photo: Penn Central GP9 7434 assists Amtrak E-unit 443 move the “Niagara Rainbow” (Detroit-Buffalo via the Canada Southern) through Canfield. This was probably necessitated by a power failure on the passenger train. | Railpictures.ca – Canadian Railway Photography – photographie ferroviaire Canadienne. Caption: Penn Central GP9 7434 assists Amtrak E-unit 443 move the "Niagara Rainbow" (Detroit-Buffalo via the Canada Southern) through Canfield. This was probably necessitated by a power failure on the passenger train. Wow, now this is one-in-a-million !! Looks to be exhaust coming out of the E8, perhaps it’s was only functioning on half power to bring about the GP9 use ..? ?